Everything working, except touchscreen and accelerometer. Use the Wexler_TAB_7200 build target. Use the Wexler_TAB7200 target for building mainline U-Boot. Use the sun7i-a20-wexler-tab7200.dtb device-tree binary for the mainline kernel. The Volume down button triggers FEL mode. 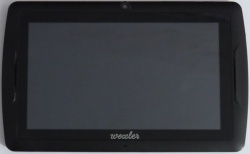 The touchscreen supported in mainline kernel via common goodix driver. No driver in sunxi-3.4, patch can be found on our mailinglist. Wexler TAB 7200 UART pads. Careful insert your plastic tool in the space between the USB HOST port and the back cover. Then, gently move the tool towards the camera, and you should soon hear the clips popping. Move the plastic tool from edge to edge, until the back cover comes off. 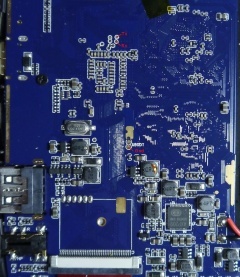 There are some small pads on the bottom of the board, near the SoC. Solder on some wires according to our UART howto. This page was last modified on 11 May 2016, at 07:31.